Births to Legal and Illegal Immigrants in the U.S.
An Excel spreadsheet showing births by state and metro area is available here. Steven A. Camarota is the director of research and Karen Zeigler is a demographer at the Center. Jason Richwine, PhD, is an independent public policy analyst based in Washington, D.C., and a contributing writer at National Review. One of the most obvious and enduring impacts of immigration occurs through immigrants' children. Long after immigrants pass on, their descendants will continue to shape the political, economic, and cultural life in the receiving society. Examining births to immigrants is thus a way of measuring the scale of immigration and its impact on the United States. Because the United States automatically awards citizenship to all persons born in the country, including those born to temporary visitors or illegal immigrants, the overwhelming majority of these children will stay in the United States. 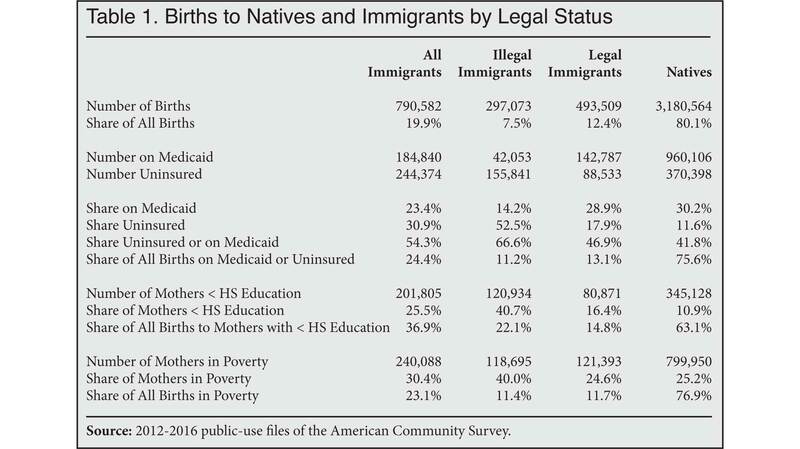 This analysis looks at births to immigrants based on an analysis of the Census Bureau's American Community Survey (ACS). 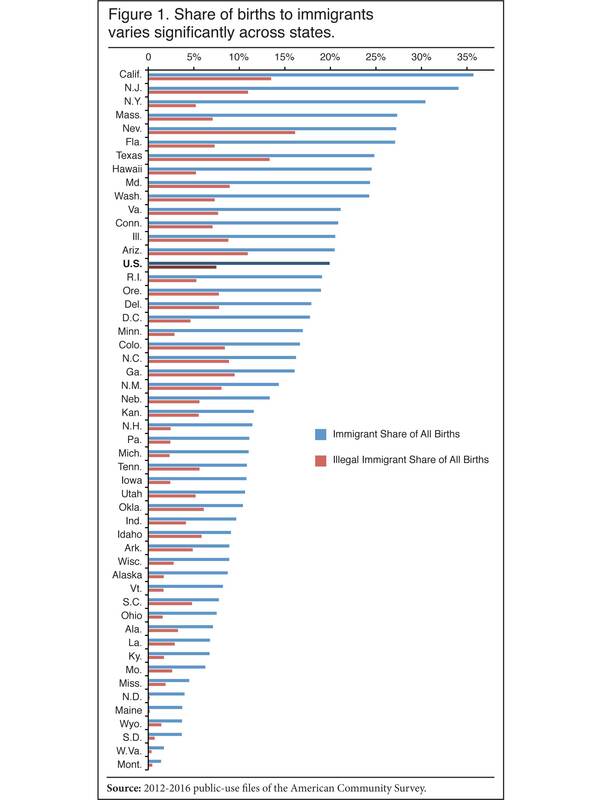 It provides a good picture of births to immigrant mothers, including the mothers' demographic characteristics.1 These characteristics allow us to estimate the likely number of births to illegal immigrants nationally, as well as births by state and by large metropolitan area. In 2014, one in five births (791,000) in the United States was to an immigrant mother (legal or illegal). Our best estimate is that legal immigrants accounted for 12.4 percent (494,000) of all births, and illegal immigrants accounted for 7.5 percent (297,000). The 297,000 births per year to illegal immigrants is larger than the total number of births in any state other than California and Texas. It is also larger than the total number of births in 16 states plus the District of Columbia, combined. Among the native-born, a large share of new mothers (42 percent) are either uninsured or on Medicaid. The rate is even higher among new mothers who are legal immigrants (47 percent) and higher still for new mothers who are in the United States illegally (67 percent). Almost all of these births are likely paid for by taxpayers. Of all births likely paid for by taxpayers, about one in four (429,000) was to an immigrant (legal or illegal). Illegal immigrants account for 11 percent (198,000) of all publicly funded births, and legal immigrants are another 13 percent (231,000). We estimate that the cost to taxpayers for births to immigrants (legal and illegal) is roughly $5.3 billion — $2.4 billion of which is for illegal immigrants. Although immigration adds enormously to the number of births, it raises the nation’s overall birth rate by only 4 percent, partly because immigrant fertility is not that much higher than that of natives. In North Carolina, Texas, and Georgia, three-fourths of births to illegal immigrants were likely paid for by taxpayers. In California, Florida, and New York, two-thirds of these births were likely taxpayer funded. In Illinois and New Jersey, more than half were likely funded by the public. 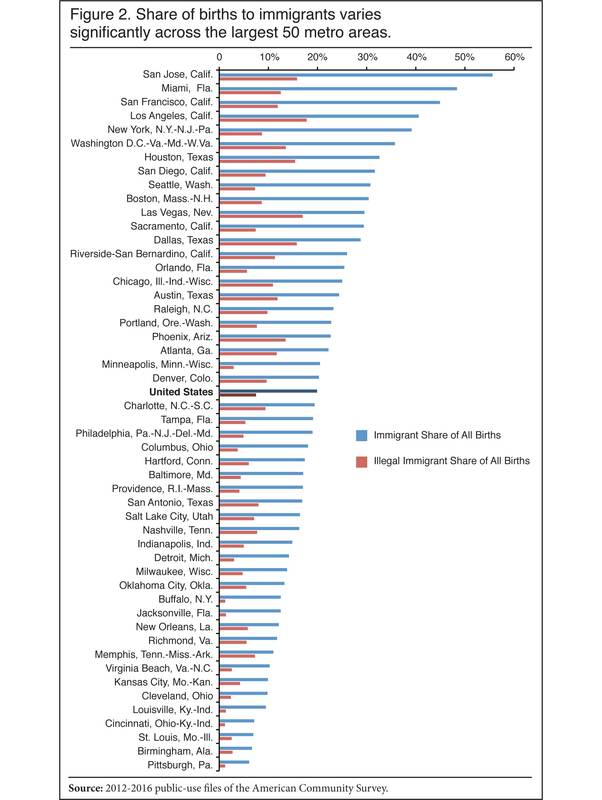 Among the nation's largest metro areas, immigrants (legal and illegal) account for half or nearly half of births in Miami, San Francisco, and San Jose, Calif. They are two out of five births in Los Angeles and the New York City area. They are also one out of three births in the metro areas of Washington, D.C., Houston, San Diego, Seattle, Boston, and Las Vegas. This analysis relies on the Census Bureau's five-year, public-use file from the American Community Survey (ACS), collected between 2012 and 2016. With roughly 15.7 million respondents, including 1.8 million immigrants, the five-year ACS is by far the largest survey conducted by the Census Bureau. It is weighted to reflect the size and characteristics of the U.S. population over the full five-year period. Definitions. In this analysis we use the terms "foreign-born" and "immigrant" synonymously. Immigrants are persons living in the United States who were not U.S. citizens at birth. Census Bureau data such as the ACS includes naturalized American citizens, legal permanent residents (green card holders), illegal aliens, and people on long-term temporary visas, such as foreign students or guest workers. Estimating the Illegal Population. Illegal immigrants are present in Census data, but they are never explicitly identified by the Bureau. To determine which respondents are most likely to be illegal aliens, CIS follows a methodology similar to those used by the Pew Research Center and the Center for Migration Studies5We start by eliminating immigrant respondents who are almost certainly not illegal aliens — for example, spouses of natural-born citizens; veterans; people who receive direct welfare payments (except Medicaid for women who gave birth within the past year and for residents of certain states); people who have government jobs; Cubans (because of special rules for that country); immigrants who arrived before 1980 (because the 1986 amnesty should have already covered them); people in certain occupations requiring licensing, screening, or a government background check (e.g., doctors, pharmacists, and law enforcement); and people likely to be on student visas. The remaining candidates are weighted to replicate known characteristics of the illegal population (size, age, gender, region or country of origin, state of residence, and length of residence in the United States) as determined by the Department of Homeland Security (DHS).6 The resulting illegal population, which consists of a weighted set of ACS respondents, can then be used to infer characteristics not published by DHS, such as births and Medicaid use by illegal aliens. Of course, all profiles of the illegal immigrant population carry significant uncertainty, and the share of births to illegal immigrant mothers across the United States are no exception. Since our estimates become less precise in smaller geographic areas, we limit the data for specific metro areas to the 50 largest by total population. Births Paid for by Taxpayers. The public cost of delivery or post-partum care is paid for by Medicaid under the "pregnancy care" provision administered by the states. Medicaid will pay for a delivery in almost all cases if the mother is uninsured or has a low income, though some mothers without insurance may not even realize the program has paid health care providers. Illegal immigrants and most new legal immigrants are ineligible for Medicaid, but the program will still cover the cost of delivery and post-partum care for these mothers for at least a few months. Funding for Medicaid comes from both the federal government and the states. The ACS is not a perfect measure of insurance coverage for mothers at the time of birth because it asks about current health insurance coverage, not coverage at the time of delivery. However, it is likely that mothers who have given birth within the last year had the same insurance status at the time of the survey as they did when the child was born. In the ACS, 99 percent of the children under one year of age whose mothers are on Medicaid are also insured by the program.7 Of new immigrant mothers who report they are uninsured at the time of the survey, 84 percent of their newborns are covered by Medicaid. Estimating the costs of publicly financed births is difficult. The amount that Medicaid spends per birth on mother and child is not something the federal government and states report. For 2010, the Guttmacher Institute estimated $12,777 for pre-natal, delivery, post-partum, and infant care in the first 12 months. Adjusting to 2014 dollars, the middle year of the ACS data in this report, would increase the amount to $13,596. We assign this cost to new mothers on Medicaid. As discussed above, 84 percent of uninsured new mothers have a child less than one year of age who is covered by Medicaid. We therefore assume that 84 percent of births to uninsured mothers were covered by Medicaid. We implement this by assigning only 84 percent of the cost of publicly funded births to new mothers who report they are uninsured at the time of the survey. This is a conservative estimate as it is likely that a larger share of these births were in fact publicly funded since only a small share of births are actually "self-pay".9 Using this approach produces an estimate of $5.3 billion in taxpayer money going to fund births to immigrants in 2014, $2.35 billion of which is for illegal immigrant births. While this estimate provides insight into the likely costs of births to illegal immigrants each year, it is only a rough estimate given the data limitations. 1 In several prior reports, we examined birth certificate records from the National Center for Health Statistics (NCHS). That data shows a higher number of births to immigrant mothers than the ACS does, partly because of the way the foreign-born are defined by the NCHS. Moreover, there is likely some undercount of immigrant births in the ACS compared to what is shown in birth certificate records. We discuss these two issues in greater detail in the methods section of this report. 2 The Office of Immigration Statistics in its estimate of the illegal population for 2014 states, "Persons who are beneficiaries of Temporary Protected Status (TPS), Deferred Action for Childhood Arrivals (DACA), or other forms of prosecutorial discretion, or who are residing in the United States while awaiting removal proceedings in immigration court, are included among the unauthorized population estimates." Further discussion can be found in Bryan Baker, "Estimates of the Unauthorized Immigrant Population Residing in the United States: January 2014", Department of Homeland Security, Office of Immigration Statistics, January 2017. 3 We should not expect the two number to line up exactly. The ACS used here is a five-year average, with 2014 as the middle year, and it is based on a survey. By contrast, the NCHS numbers are drawn from administrative data. Furthermore, the ACS is weighted to reflect the middle of the year, while the NCHS data applies only to calendar year 2014. The NCHS final data for 2014 can be found in "Births: Final Data for 2016", National Vital Statistics Reports, Vol. 67, No. 1, U.S. Department of Health and Human Services, January 31, 2018. 4 There were 9,644 births in which the nativity of the mother was not reported in the public-use NCHS data. Using the NCHS definition of the foreign-born shows 829,293 births to immigrant women in the ACS. The number of births to immigrants in the ACS defined in this way is still 42,963 lower than in NCHS data, but it is about half the 81,674 when using the Census Bureau definition of the foreign-born. This means that the birth records show 4.9 percent more births to immigrants than does the ACS, which may be due to some foreign-born mothers reporting that they are U.S.-born. The 4.9 percent could be a measure of the undercount in ACS data among immigrants, at least those who give birth, but more analysis would be needed to confirm that. 5 See Jeffrey S. Passel and D'Vera Cohn, "Overall Number of U.S. Unauthorized Immigrants Holds Steady Since 2009", Pew Research Center, September 20, 2016; and Robert Warren, "Democratizing Data about Unauthorized Residents in the United States: Estimates and Public-Use Data, 2010 to 2013", Journal on Migration and Human Security, Vol. 2, No. 4, 2014. 6 We chose the 2014 DHS estimates to represent the middle of the 2012-2016 period covered by the five-year ACS data used in this report. About 90 percent of illegal immigrants are thought to respond to the ACS. See Bryan Baker, "Estimates of the Unauthorized Immigrant Population Residing in the United States: January 2014", Department of Homeland Security, Office of Immigration Statistics, July 2017. 7 This is based on linking new mothers to their children less than one year of age in the ACS data. The public-use data shows that for mothers currently on Medicaid, 99 percent of their children under the age of one are also on Medicaid. 8 See Table 19 in "Births: Final Data for 2016", National Vital Statistics Reports, Vol. 67, No. 1, U.S. Department of Health and Human Services, January 31, 2018. 9 Ibid. NCHS reports that 4.1 percent of births were "self pay" in 2016.